Twin Cities Restaurants – SPAK will snack. We're celebrating every food holiday. Every. Single. One. 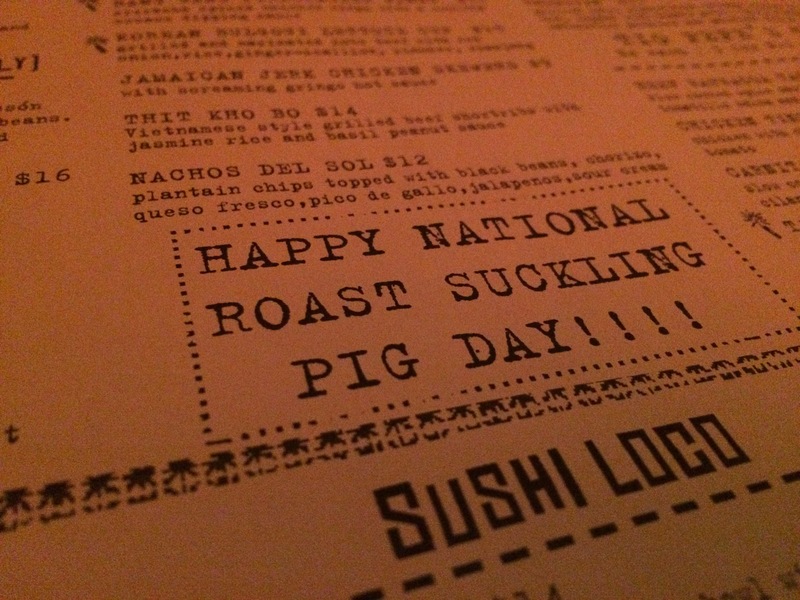 IT’S NATIONAL ROAST SUCKLING PIG DAY! 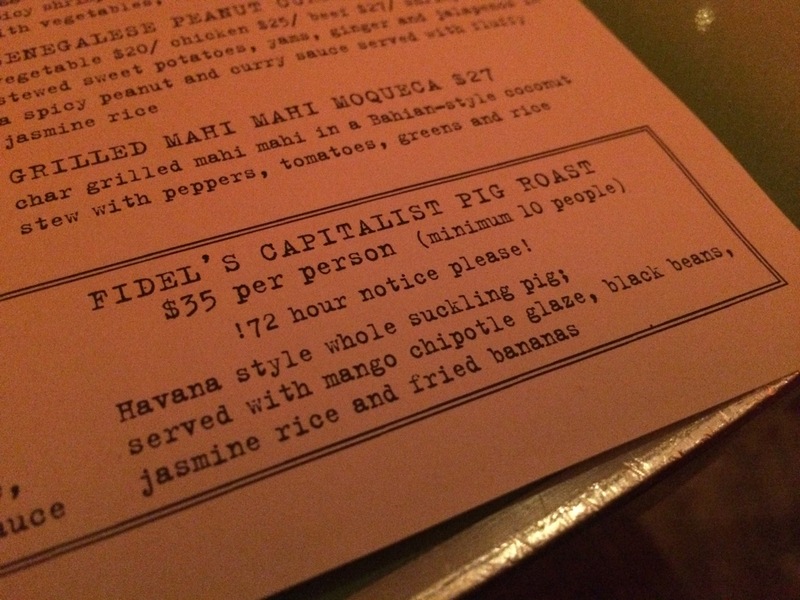 Cultures across the world have all independently found that young pigs make for quite the roast. Pig is one of the earliest animals domesticated for slaughter, so it was only a matter of time before we figured out the age thing. Suckling pigs’ skin ends up being very tender and the meat is almost in a state of gelatinousness. Plus, you can roast the whole thing at once, because at 2-6 weeks of age, these guys aren’t too huge yet. So we gathered up a total of 10 people and made plans for this pig roast. It was quite the party. They even printed this up on the menus for us! SP got to have the head. Cheek meat!! Tender and terrific and lots and lots of leftovers. We had a lot of fun! Tomorrow is National Oatmeal Muffin Day and National Hard Candy Day. Say that three times fast. -The ingredients have to be added one by one rather than all at once. Talk about inefficiency for the sake of taste. -You have to make a rouille, a garlic egg-yolk mayonnaise, and serve it on toast with the soup. -Serve the soup really hot, with the fish on a separate platter. We went to one of the only remaining restaurants of the Twin Cities that still serves Bouillabaisse (now that Vincent is closed), Sea Change. It’s a pretty lovely restaurant connected to the historic Guthrie Theater. Needs no explanation on this menu. Only for the enlightened. The rouille is on the bottom of the left piece of toast because SP was clumsy and knocked it over. A view with the toast removed. Really hearty and delicious. If you like seafood, this is definitely a winner. Tomorrow is National Cupcake Day! TODAY IS NATIONAL SACHER TORTE DAY! But what is it? Chocolate cake? That’s it? NO! It’s a super dense chocolate cake with a dark chocolate finish that obscures a thin layer of delectable apricot jam. That’s a cake we can get behind. Or… a cake we can put in our faces. Thanks to Black Forest Inn, we didn’t end up having to make one today. Theirs was delicious! Served with a little cup o’ whipped cream. See that cute layer of apricot? Tomorrow is National Gazpacho Day. In France it’s just called, “toast,” right? IT’S NATIONAL FRENCH TOAST DAY! Actually in French it’s called pain perdu, because you use “lost” (i.e., stale) bread to make this delicious treat. But considering how ancient the recipe is, over time we’ve learned that we can still use decent bread. If we had our way, we would have made a special trip to The Buttered Tin in St. Paul because they make an unbelievably good Bananas Foster French Toast. Heck, SP would have settled for having his Jimmy Dean French Toast Griddler at breakfast like olden times before stores stopped carrying it. Instead, AK was kind enough to demonstrate the basics of making french toast. Add in the milk, cinnamon, and vanilla. In the scheme of things, most breakfast foods are equal in our minds. That is, pancakes/waffles/french toast. But depending on the quality, french toast can really be amazing. Tomorrow is National Lemon Creme Pie Day! IT’S NATIONAL BAKLAVA DAY AND NATIONAL HOMEMADE BREAD DAY! Baklava is a sophisticated dessert. Much of our Mediterranean friends disagree that it’s anything special, but I mean really. We’re simple people. We would eat a block of chocolate and it would be amazing. Backpedaling, we’re not saying chocolate isn’t sophisticated… just that Baklava has layers. Layers of filo dough and chopped nuts! It’s all held together by a very particular honey-ish syrup that is characteristic of any baklava. Porque no los dos? We had to try both. The chocolate drizzled one was excellent. We wish you could smell this! Tomorrow is National Vichyssoise Day. IT’S NATIONAL PIZZA WITH EVERYTHING (EXCEPT ANCHOVIES) DAY AND NATIONAL CHICKEN SOUP FOR THE SOUL DAY! Everything?! Well, almost everything. For some reason, anchovies were left off of tonight’s menu by the powers that be. It wasn’t us. We’d eat anchovies. We were able to swiftly pick up pizza at a local joint called Fresh Picked Pizza. They have all sorts of really tasty pizza, but we knew that we had one in mind to get fixed up for the evening. Do note the lack of anchovies. As a personal-size pizza, you can barely fit all those ingredients on there. Wonderful. Today’s other holiday comes at a fortuitous time as AK is battling the Minnesotan common cold. (We’re sure SP will follow suit shortly.) Truly there is no better remedy for the insufferable symptoms quite like a homemade Chicken Soup. It warms the heart and soul and tummy. Thanks to SPom and SPad for always having the tastiest and most comforting chicken soup. Since SP moved out of his parents’ house, seeing a huge container of chicken soup like this is not infrequent. With carrots and matzo balls of course. We feel comforted by our comfort foods. Tomorrow is National Indian Pudding Day! IT’S NATIONAL CALZONE DAY, NATIONAL DEEP FRIED CLAMS DAY, AND NATIONAL VINEGAR DAY! Riffing on this Ben Wyatt from Parks n Rec thing… if we were to make a restaurant to celebrate folded pizza, it would be specifically diet-friendly and located in areas nearby Los Angeles or San Diego. It would be called the Local LoCal Low-Cal Calzone Zone. But for reals. Calzone Day was just established recently. Specifically, it was petitioned by Minsky’s Pizza on their 40th anniversary. So hooray for them! Today also celebrates something we were worried about finding. There are always days like that. Sea Salt, which we visited for fried scallops, closed for the season at the end of October. Our next best bet was a place called Mucci’s, which is known for their deep fried – wait for it – pizza. Yeah. We were excited to see they also had clam fritti. But when we called at 4:45 to ensure they had our item, we were aghast to find they didn’t have any! As of November 1st, today was a menu change, and they don’t have ’em anymore. We were in luck that a local joint by SP‘s old apartment had the goods for us. Here’s Mac’s Fish and Chips. The menu on a white board. Too quaint not to share. “We don’t have soda. We have POP!” Thanks, Minnesota. SP approves. SP got half clams and half cod. Mmmmm those clam strips were AMAZING. AK went full-blown Minnesotan and got Walleye. Probably was from Lake Wobegon. And what’s this? Malt vinegar to have with our fish n chips? Such that we can enjoy National Vinegar Day? Perfect! Despite the troubles, today was a success. We could’ve clammed up, but we got out of our shell and had an adventure. Tomorrow is National Deviled Egg Day. Get our updates all up in your inbox.